Mary Ann accepting the Premio Artusi award in Forlimpopoli, Italy, home to Italian writer Pellegrino Artusi for whom the award is named. Artusi wrote the definitive work, The Art of Eating Well, which became the benchmark cookbook for all Italians. 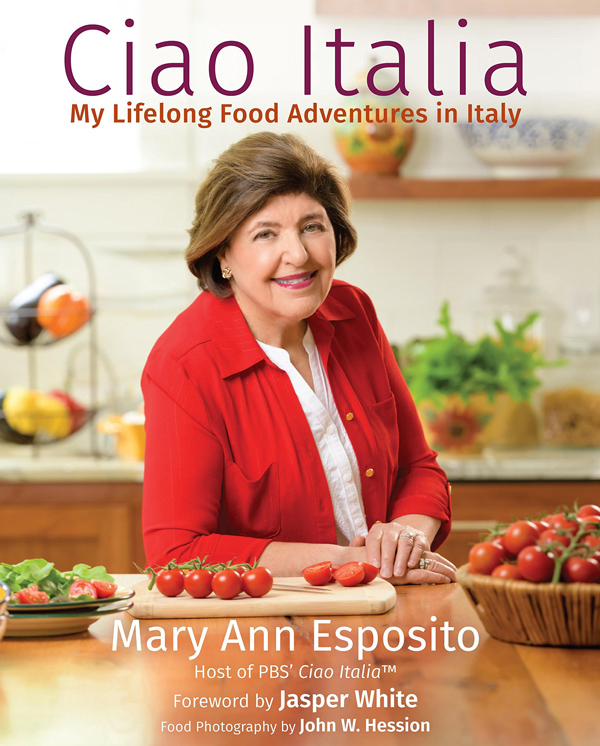 For Mary Ann Esposito, life has always focused on food. The eldest daughter of an Italian American family, Esposito grew up in Western New York learning the rich tradition and skills of cooking authentic southern Italian cuisine. Her mother and Neapolitan grandmother ran a boarding house where the family also lived, and the kitchen seemed to remain at the center of all aspects of their bustling life, business and family alike. And whether she knew it or not at the time, Esposito’s life was heading down a path steeped in her heritage. “Subconsciously, these women really influenced me with their dedication to the family,” she says. “That’s the key thing about Italians in general. The family is the glue that holds everything together, and a big part of that glue is the food.” If there was a wedding, food was the natural way to celebrate. If someone passed, food helped them to mourn. If there was a birthday, a holiday, a get together of any kind, it was food that made them more than gatherings. And even on vacations, the preparation of food seemed to slip its way into their days. Esposito grew to love Italy more and more, and as her love grew so too did her commitment to traveling there to take it all in. “Italians use food to feed themselves but to also describe their feelings, their traditions.” She’s visited more than 30 times, and each time, she’s kept a journal to log her adventures, the people she met, the dishes she ate, the traditions she learned or participated in. And those journals? They became the foundation for each one of the 13 books she would eventually write. Each section of the book offers a glimpse into life in Italy. It helps readers understand why certain types of dishes are important to the culture there. As Esposito explains, “Given that Italy is surrounded by water on three sides, it is easy to understand why seafood is a big part of the diet.” Make sure to try Mary Ann’s Insalata di Mare, a pure example of this philosophy. The recipes that follow are simple, easily digestible in both format and language. Readers are treated to short factoids about a key ingredient in the recipe or a story from one of Esposito’s many adventures. And beneath all of that, evident in her writing and understanding, is a sincere appreciation for the traditions instilled in her by her family. This rich and succulent seafood medley is best when allowed to marinate for several hours or overnight. The presentation is nice, too. • Fill a medium saucepan with water; add the lemon slices and a pinch of salt and bring to a boil. Lower the heat to a simmer, add the scallops, and gently cook them for about 3 minutes, or just until they look opaque. Remove the scallops with a slotted spoon to a large bowl, keeping them in a pile. Set aside. • Add the shrimp to the saucepan and cook them for about 2 minutes, just until the shells turn pink; remove the shrimp with a slotted spoon. Cool, peel, and devein the shrimp. Place them in the bowl with the scallops. • Add the squid rings to the saucepan and simmer them for about 20 minutes, or until they are tender. Cooking them too fast over high heat will make them tough. Remove the squid rings with a slotted spoon and add them to the bowl. • Pour the olive oil into a 9 x 12-inch glass casserole dish. Stir in the lemon juice, celery salt, and 1 teaspoon salt. Mix well. Add the scallops, shrimp, squid, and crabmeat to the olive oil mixture. Stir to combine well. Cover the dish with plastic wrap and refrigerate it for at least 3 hours or overnight. 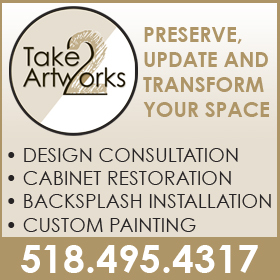 • When ready to serve, have 8 martini glasses or small ice cream sundae dishes ready. Wet the rims of each glass and dip the rims in Margarita salt, if desired. 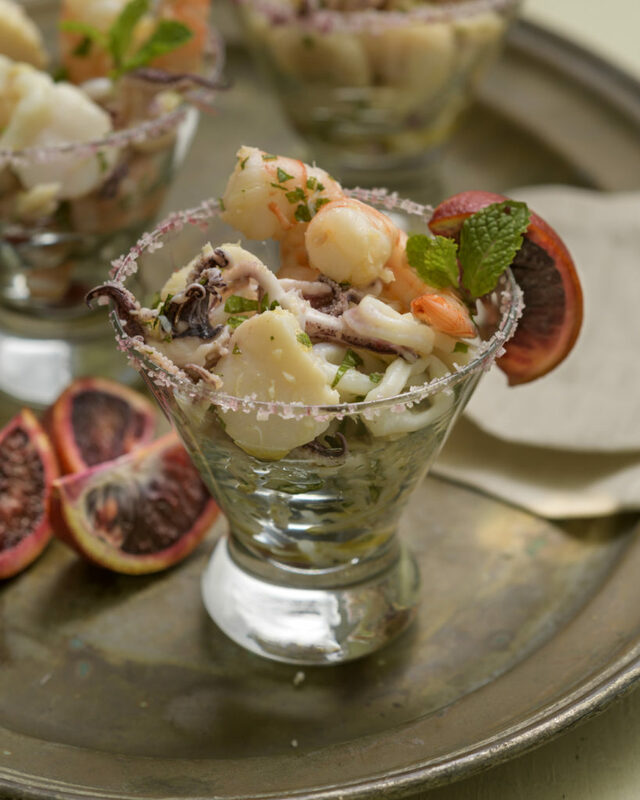 • Stir the mint into the seafood mixture and spoon it into the individual glasses. • Pour a little of the fresh orange juice over each dish. Make a small knife slit in the center of each orange wedge and anchor one over the rim of each glass. Serve.